Alexandra Bee Blog: Oh, Blue & White! Happy Thursday readers! I am counting down the hours until the weekend! It has been a long week and I am ready for a break and also to see Bryce (he gets home from Massachusetts just in time for a dinner date tomorrow night!). Today I bring you Student Teaching Guest Post #4. Tina, from The Enchanted Home agreed to write a post about our shared love for blue and white in decor! 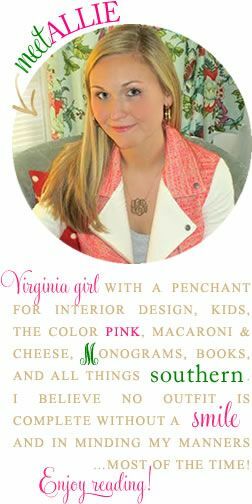 Her blog is like flipping through your favorite design magazine and she is also SO sweet! Enjoy! Good morning! First a thank you and shout out to Allie for asking me here, I so enjoy her blog, isn't she just the sweetest? And so pretty too! I love visiting her daily and seeing what her beautiful eye has found or what she has done for the weekend! She is one classy girl and I love her beautiful taste and sense of style. We both agreed it would be great for me to do a post on a subject near and dear to my heart...blue and white! Its no secret to anyone who knows me that I love, adore and covet all things blue and white. 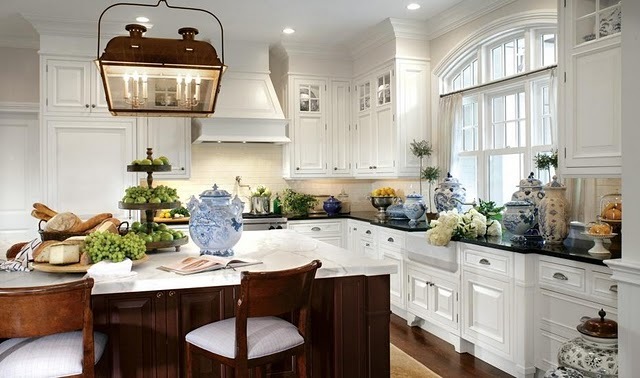 Besides it being elegant, timeless, fresh, crisp, refined, welcoming, pretty, charming it is above all else an incredibly versatile color duo that can rock its magic in an uber formal home as much as it can in a more contemporary counterpart. 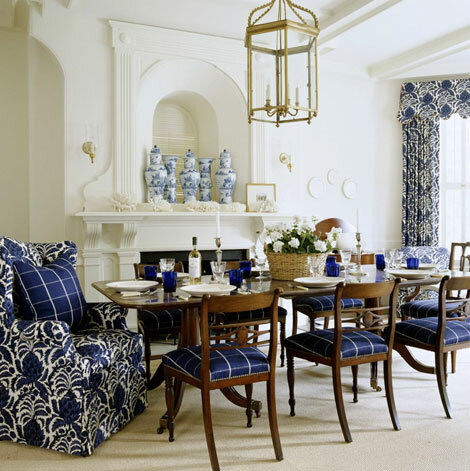 Whether its blue and white chairs, walls, blue and white porcelain accessories, a blue and white rug, blue and white reigns supreme in my eyes! 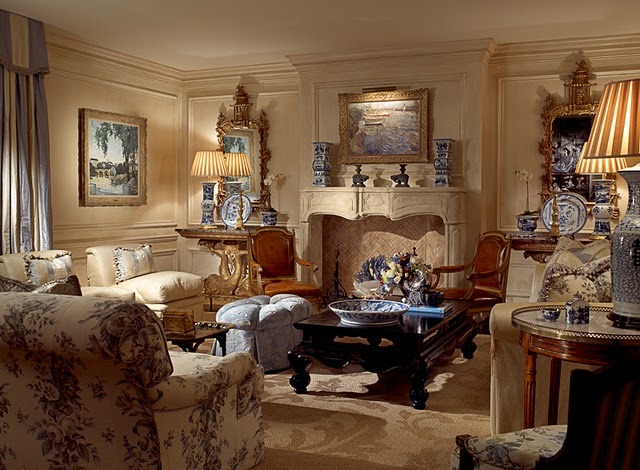 So today a few examples in different styles of rooms that I think beautifully exemplify why this combination just works so well! Do you agree? 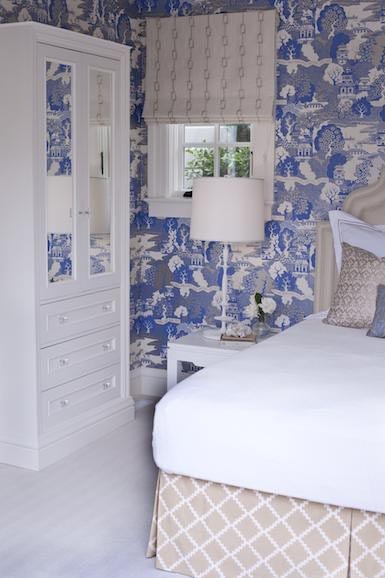 How great looking is this blue and white jar wallpaper? Guess who.....Ralph Lauren! So that's my wrap up for blue and white...truth is I could keep going and going and going, it never gets old and I never stop being inspired by it. What are your thoughts on blue and white? Thanks so much Allie again for having me here! It was a pleasure! Now I just want a pop of blue somewhere in my home. love those blue whicker chairs - on that porch. Tina is the sweetest and always is full of inspiration. Tina, I love my blue/white ginger jars on the mantle & plates in my kitchen. Love an entire cabinet filled with blue & white. 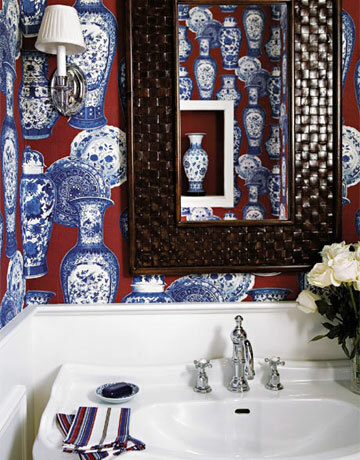 In fact, nothing else I have tried looks as elegant & beautiful as blue & white porcelain in a neutral room. I can not wait to see your home completely decorated and all of your blue & white accessories as well. Ps. I found two beautiful blue/white small vases with brass/gold base very similiar to yours and I LOVE them..thanks for the inspiration. I searched until I found them. 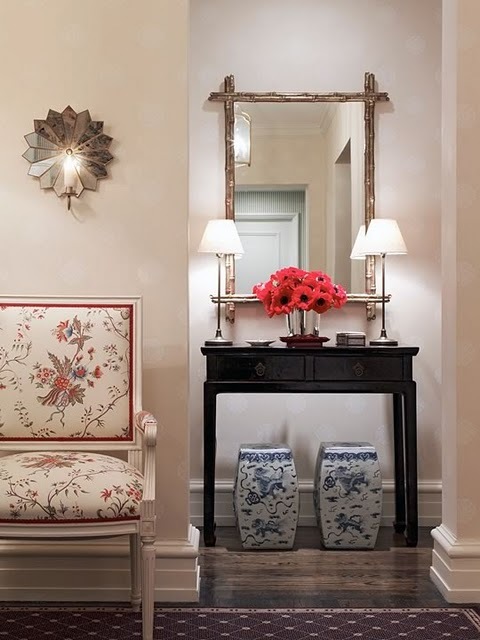 I have on in the formal powder room and one in the living room and they look great with so many different floral arrangements,,Thank YOU! oh how i love blue and white!!! This was pure heaven! What a beautiful post Tina! I love blue and white as much as you do and have it all over my house. My husband said he feels like he lives in a china shop;-) That first picture is so pretty, gives me a good idea for my breakfast area. So nice to also discover a wonderful new blog too. Thank you both for putting this together. 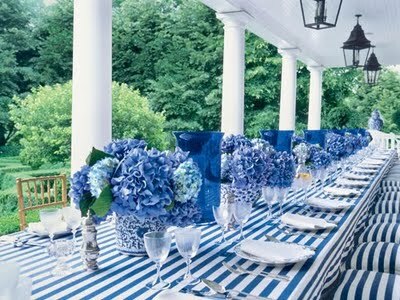 I also love blue and white, I have used these colors throughout my house. I don't think I can ever get tired of it! Tina, as always thank you for gathering up such beautiful images. I love the pictures! 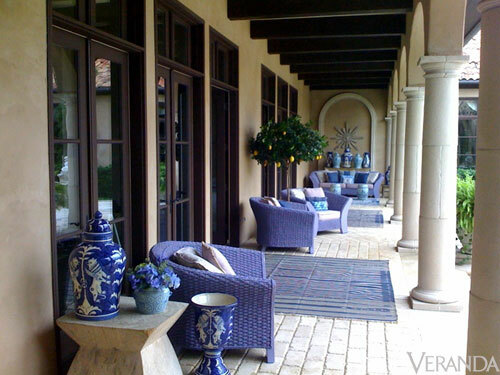 Blue and White is such a great color combination for a house! Thanks fo sharing!! I love this post. I was, of course, looking for a photo with my favorite little blue and white vases of yours! You did choose some amazing images. And thank you for introducing me to another wonderful blogger. Love all of these! 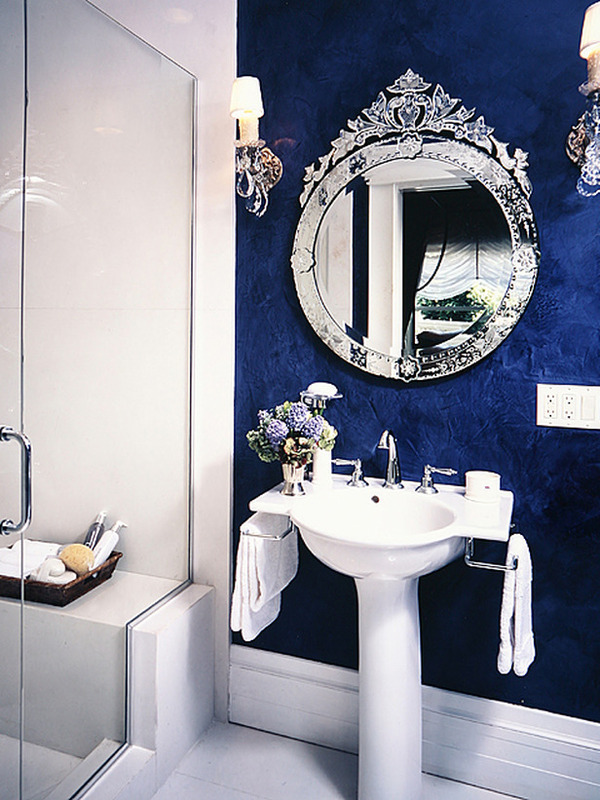 Especially the navy bathroom and the blue and neutral toned living room! So pretty! You can never have too much blue and white! Tina always curates the most beautiful images and her enthusiasm bubbles through in her descriptions. Terrific post! Love all of these images! I'm always excited when I find new blue and white images that I haven't seen before. Wonderful post! I love blue and crisp white- such a classic combo...a beautiful post from Tina...she always manages to find so many gorgeous photos!!! What a terrific post. I am going to send this to my mother who collects blue and white everything. Seriuosly its a ridiculous obession, I have some in my dinnig room and kitchen and it does give such a special touch to the rooms. Tinas posts are the best. I am happy to discover yet another terrific blog in the process! I am a huge fan of blue and white and I especially love cobalts and creams together. Peacock is piquing my interest now too. Fun to come to another great blog. This is a beautiful rich looking post. Elegant. I love the look. You did a great job. Such a lovely post. Blue and white is timeless. Fabulous images. Hi, Tina. 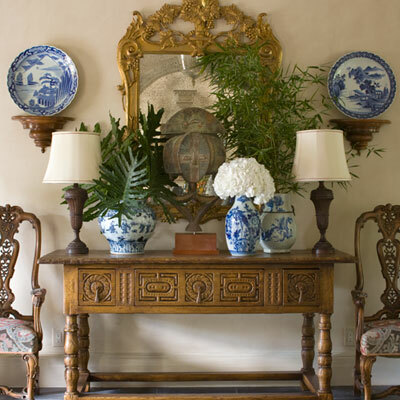 I also am among the hordes who love blue and white whether it be ginger jars, garden seats, textiles, Minton china, etc., I can never get enough. Thanks for the lovely images. Leave it to Tina to inspire us with such great pictures! Love blue and white since they work with every other color. 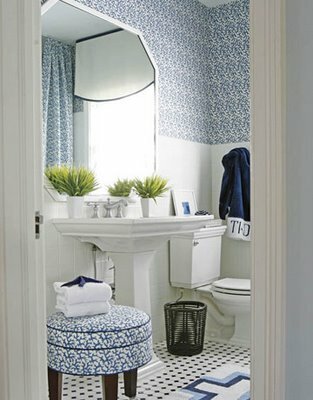 Blue and white is one of those perfect color combos that can be both masculine and feminine and can work so well with so many pops of color added. Blue and white will always be a winning combination! Gorgeous pictures, as usual! This is a great guest post! 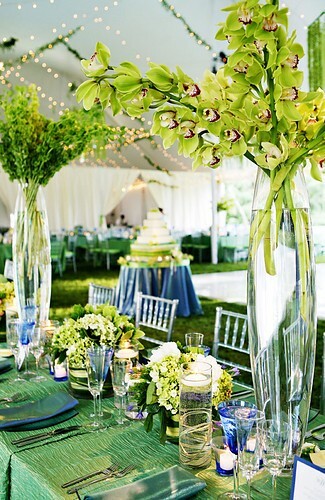 Blue and white is gorgeous together... and these images are inspiring! 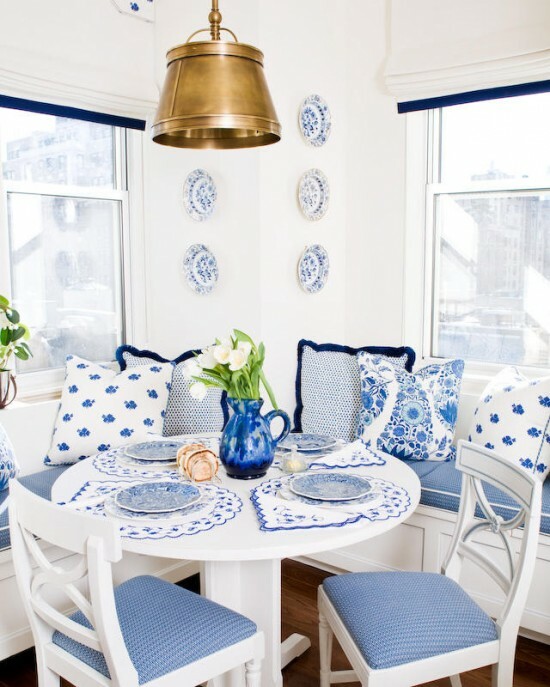 I am a big fan of Blue and white and of Tina's blog. Thanks for sharing these beautiful rooms. Such a classic color combo, you can't go wrong! That last shot of Martyn Lawrence Bullard's design is my favorite! Well ladies, this is the perfect post for this blog. Every image is a favorite. Rock on, guys...great job!! What a beautiful post. i got so many great ideas here! Love that first image and the last, are my two faves. 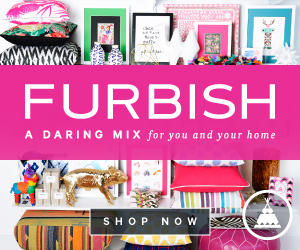 Am a big fan of Tina's blog and now glad I found this one too....new follow here! Well done to both of you. Love, Love, Love Blue and White together. Beautiful photos. Love all these looks, lady! 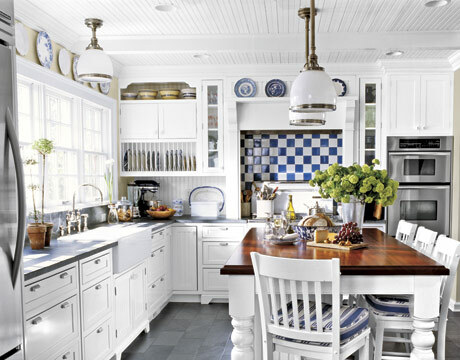 I am definitely going to have a blue and white kitchen in my future house! What a lovely post! This is the perfect combination of colors that goes with perfectly everything!